The Super Bowl is arguably the most highly anticipated entertainment and sporting event of the year, and Monday’s’s #SB51 did not disappoint. From Lady Gaga jumping off the roof of the stadium to the New England Patriots beating the Atlanta Falcons 34-28 after a scoreless first quarter, it was clear from the beginning that the game would get people talking. 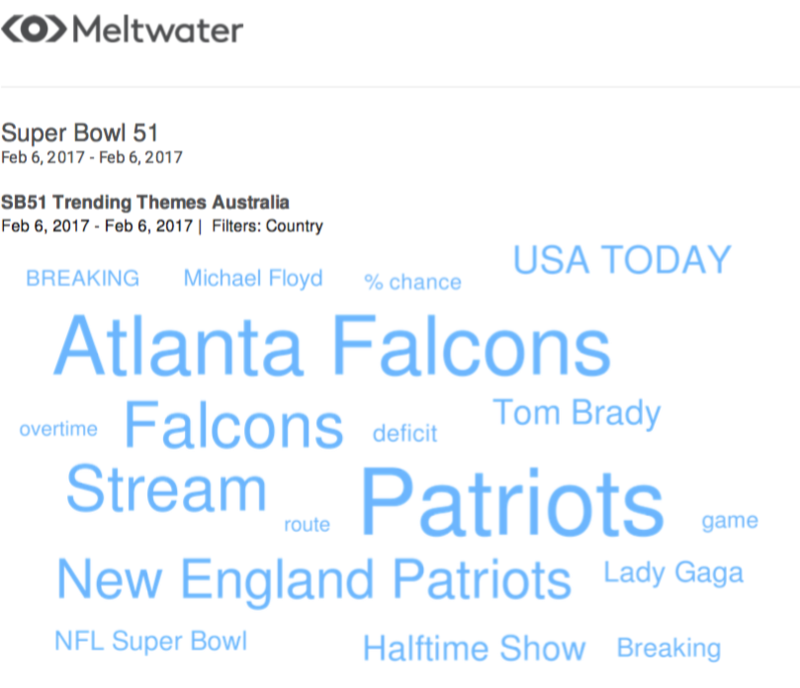 Media intelligence company, Meltwater looked into how people across the globe were reacting to Super Bowl 51 to reveal some interesting insights. The New England Patriots won both on and off the field, dominating social media conversations down under, alongside quarterback Tom Brady (who has now broken the world record for his fifth Super Bowl as quarterback) and Lady Gaga. The issue of streaming was also a hot topic on social for Australians following a technical glitch with Fox Sports Go’s live stream during the critical fourth quarter, sending Twitter into a frenzy. 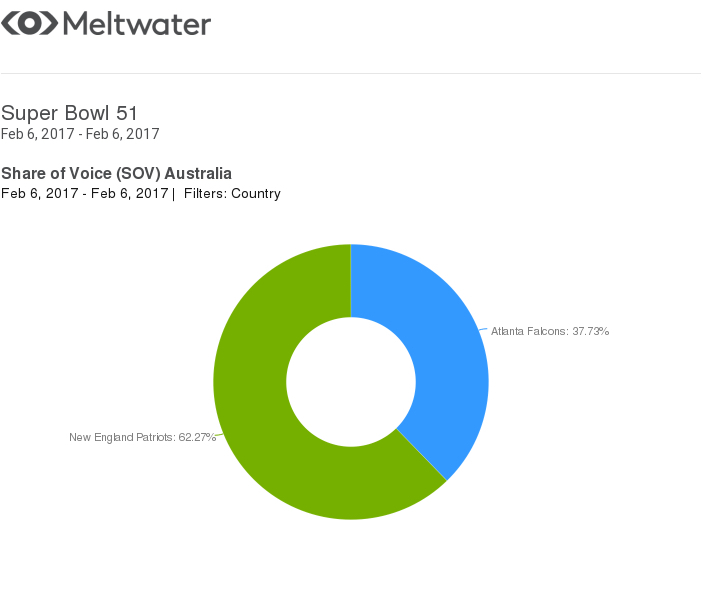 There was also a significant spike in the share of voice on social in Australia for the New England Patriots following their win, jumping from 51 per cent to 63.3 per cent shortly after the game. Interestingly enough this did not translate in a global context, with the Patriots share of voice on social media only increasing by 5.5 per cent post-game. And it wouldn’t quite be the Super Bowl without the highly anticipated halftime commercials. 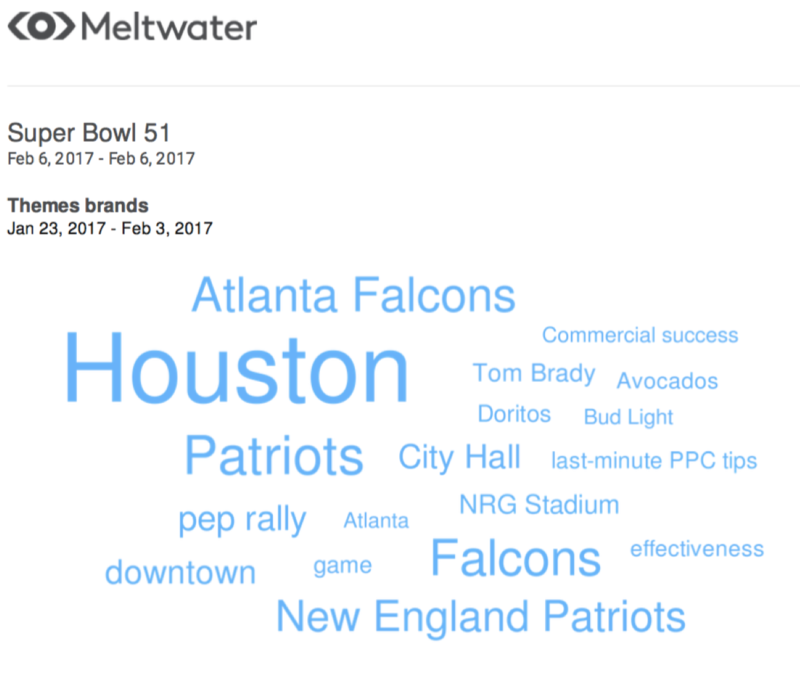 Meltwater took a look at the brands trending ahead of #SB51 and found Doritos, Avocados from Mexico and Bud Light generated the most buzz within the wider conversations taking place around Super Bowl on social media. While we now have another year’s wait for the Super Bowl 52, it will be interesting to see how fans continue to interact with the teams, players and advertising brands, and in turn whether the brands engage with their audiences and make the most of what is arguably the world’s largest stage for advertising.